I am new to the LEGO "business". But I am building up my inventory, getting close to 100.000 pieces now, and before shooting off, I want to have my "system" organized. That also includes print off labels for every small part, to glue on the separate box/draw for item. This makes it easier, and more safe for proper work by several people, assuring that the right part is picked. Tom Alphin has a template of labels you can download and print with the appropriate label printer. It allows you to select which parts you want to print and allows you to print the labels in your custom size, fitting the drawers perfectly. I would start with looking at the way Bricklink has their catalog organized, or look at LDraw's catalog. They have a fairly basic system segmenting LEGO into bricks, plates, tiles, beams, rods, minifigs etc. Should get you going. 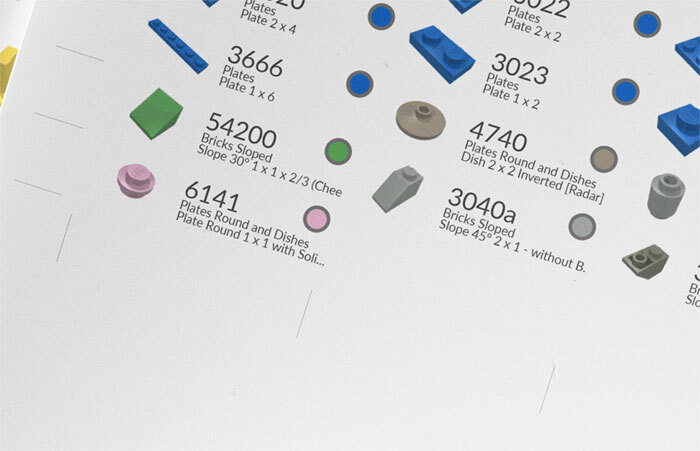 EDIT: And if you really want to ID each part, just use the Bricklink part numbers (same as LDraw's numbers) to print on the bins. The Catalog feature should help you getting those, once you are familiar with the Bricklink naming schedule. Not the answer you're looking for? Browse other questions tagged piece-information storage inventory or ask your own question. What is an Erling brick? What is inside the “weight element” brick? Does the LEGO company sell LEGO brick organization bins? How much does a LEGO brick weigh? Why was the 1x1 round brick changed? Is there a 2x12 size Lego Brick? Does this 2x4 brick exist? What is the Travis Brick? Can someone identify this brick? Why are different ID informations printed in the inside of the same sort of bricks?